Delicate Curves Jewelry - This is a handcrafted pair of beautiful dangle earrings created from high polished strips of sterling silver that feature round red Coral. These are light and fun and shown pierced, but available as clips. 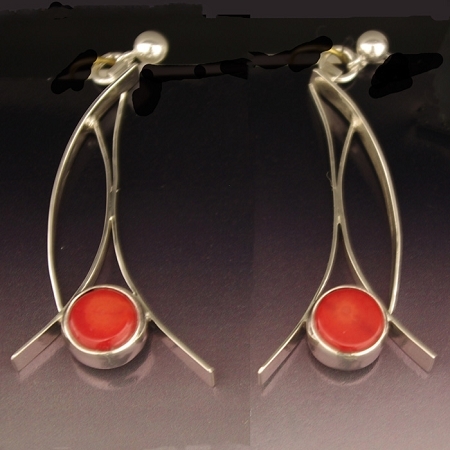 Sterling silver earrings with red coral (polished natural shape) shown as pierced, but available with clips. Designed by Aaron Rubinstein and handmade by Modern Art Jewelry.